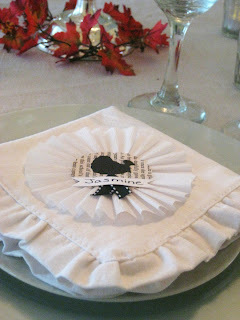 Yesterday I promised to show you how I made the placecards for my Thanksgiving table. In order to show you how I made the pacecard I've broke it down into three sections. OK, here we go. . . . Glue top layer to bottom layer . . .
That's it. Very easy and I love the look. That is precious! Thanks for the great tutorial. I've been trying to figure out how to make my crepe paper ruffles look more precise and tidy. I guess I have been kind of folding and glueing at the same time. Your technique works so much better, and I really like the idea of drawing a guide. Thanks so much for the tutorial! Those are just too cool and the turkey could be replaced for a tree for Christmas. Don't you love working with crepe paper? That's what I did today...for hours!!! Cute Cute Cute! Thanks for sharing.